"Interesting discovery and translation by publishers from an Eastern European scene much underrepresented." "Communism under Nikolai Ceaușescu was part tragedy, part farce and a rich thread of absurdity, suffering and black humour laces Hrib's crisp and entertaining delivery." "This book is different. [...] It is also imaginative and inventive. Keeps you guessing all the way. An excellent book." "It is certain that Bogdan Hrib can write and that his translators Ramona Mitrica, Mike Phillips, and Mihai Risnoveanu have done a great job." 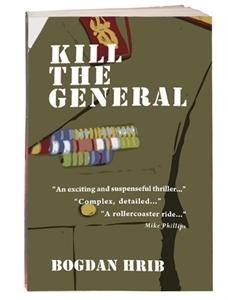 "Kill the General is a book that got me hooked from the very start - I am not a great fan of thrillers but the twisting story line and the frank narration style let me discover a character, flawed and virtuous in the same time." "Eastern European crime fiction at its finest, with the right quantity of communist memoir, post-EU-adhesion blues and realistically Romanian surreal moments"